How did Trash Mash-Up start? We wanted to do a community-based project. We are art nomads going to non-traditional art spaces. Without a budget, we naturally started working with trash. But that also came out of a need for environmental education and wanting to inspire programmers to think out of the box. You don’t have to have a budget to do arts programming, you throw away art supplies every day. One of our taglines is: “Saving the world never looked so good.” Trash Mash-up was featured in a UNESCO report as one of three non-profits doing good work. We are small but we are mighty, just two sisters who work full time. Do you work around themes? All of our projects are based on world mask traditions. We talk about those traditions and we “contemporize” and “urbanize” them. The cool thing about mask tradition is that it’s all based around bringing communities together and every culture has it: Native American, African, Asian. How do you collect the trash for your workshops? It’s not like we dumpster dive. We have businesses and households who collect trash for us, like soy milk containers, juice boxes, and chip bags. Where do you hold programming? We try to focus on the Western Addition and the Bayview. We work wherever we can in YMCAs, cultural centers, section eight housing community rooms, beacon centers, after school programs. Stern Grove, Yerba Buena, and the public library have been big partners of ours. The library is doing great work. They are trying to transform libraries into community centers. We are fiscally sponsored by Counter Pulse. City CarShare supports us a lot. When we need it, they give us a car. We were able to secure some storage space through the VA; it was very generous of them to give us that space. We don’t pay ourselves and it is very much a not for profit. We don’t charge for workshops; if people can pay we will accept it and that will offset the free workshops. We both live in the Western Addition, which, along with the Fillmore, is our favorite neighborhood. The diversity, the opportunity, the art and the community; it’s an awesome place. Jessica: For me there is such a class war, a social divide going on. When I first came to San Francisco you would get into conversations with a stranger at the bar and there would be almost a competition of how much good are you doing and what outrageous art you were making for how little, and now you are being filmed by Google Glasses. Bridget: Despite all that has happened in the city and the evictions and people moving to Oakland and moving out of the Bay Area entirely, there are still so many awesome people that inspire me – not just artists, but people working in non-profits and social services in the trenches with the people. Cultural traditions, Vivienne Westwood, Jean-Paul Gaultier, Cyndi Lauper, and Adam Ant. Outrageous, punk, avant-garde, face paint and costumes. 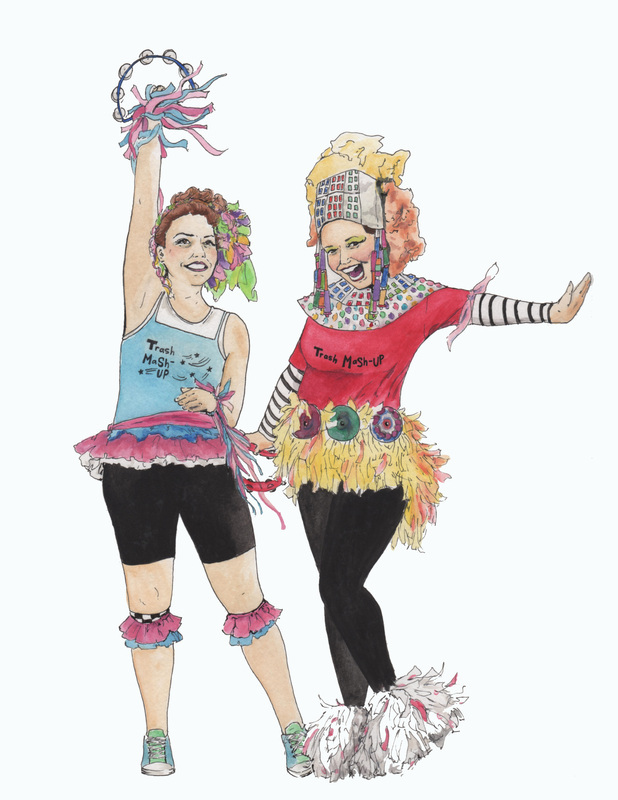 Cyndi Lauper’s newspaper hoop skirt from True Colors; that’s basically trash mash up. The Green sisters, Melonie and Melorra With the African American Arts and Culture Complex in the Western Addition, The Jennifer D’Angelo who runs Nooworks on Valencia, Michael Johnstone and David Faulk of Verashpere and The Sisters of Perpetual Indulgence – the work that they do is so important and they do it in such a joyful way. The cultural centers are doing great work on limited budgets. We also like Micah and Deborah at Recology with the artist-in-residency program. That’s a really cool program. They bring in all these artists and get them inspired by items that San Francisco has discarded.